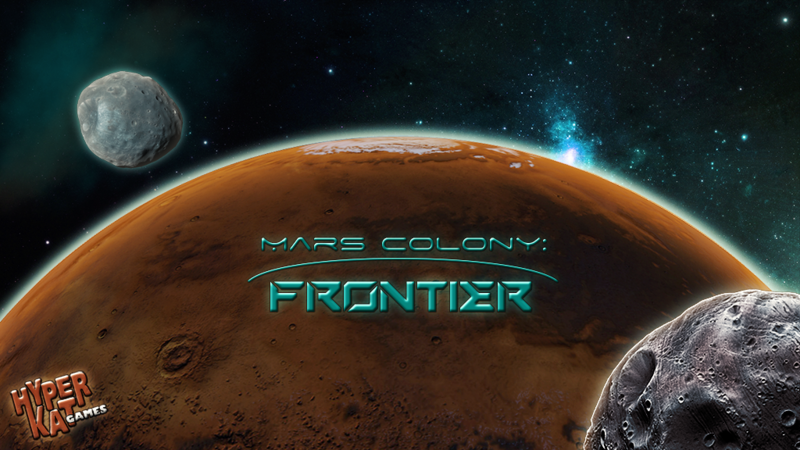 We have started development on the next generation of the Mars Colony game. This second version is code name Frontier and we have reached a late Alpha state. Update on the Mars colony. Ares base has been established. A steady stream of personnel and supplies are being sent to the colony. Major corporations from Earth have supported this effort by investing in a future of scientific and economic development. This has been a major success story for all mankind. Media headlines from all over the Earth expounding on the success of our missions to Mars came to an abrupt halt after the crash of the global economy and the wars as a result of shortages of food and fuel. Mars missions have to be put on hold for political and economic reasons. The few ships that were already in orbit or on their way to the red planet would be the last source of supply and personnel sent for the foreseeable future. Ares Base was going to have to survive on it’s own until things on Earth could be resolved. Mars News Network Sean Stewart reporting…. The global economy back on Earth has fallen even further into ruin resulting from the ever growing problem of supply distribution, and no clear solution for an end stands within sight. Bank and corporate stocks are falling to record lows pushing even the richest and developed of nations and territories into disarray. Civil unrest is running rampant all over the planet as populations demand reform. Aggressive protests in addition to riot demonstrations within the streets of capitals have caused gridlock throughout the planet. In response, many governments are declaring states of marshal law in efforts to calm situations. Economists and sociologists say the global condition of Earth is worse than the Great Depression of the 20th century. Pollution, cyber terrorism, and hyper – population are magnifying the problems that stem from rampant corporate greed. Global treaties and agreements are on the verge of collapse as world leaders fail to reach a joint compromise on how exactly the world’s problems should be approached and tackled. A U.N. meeting in Aurion later this week will hopefully shed light on global leadership’s plan to restore peace and order to Earth. 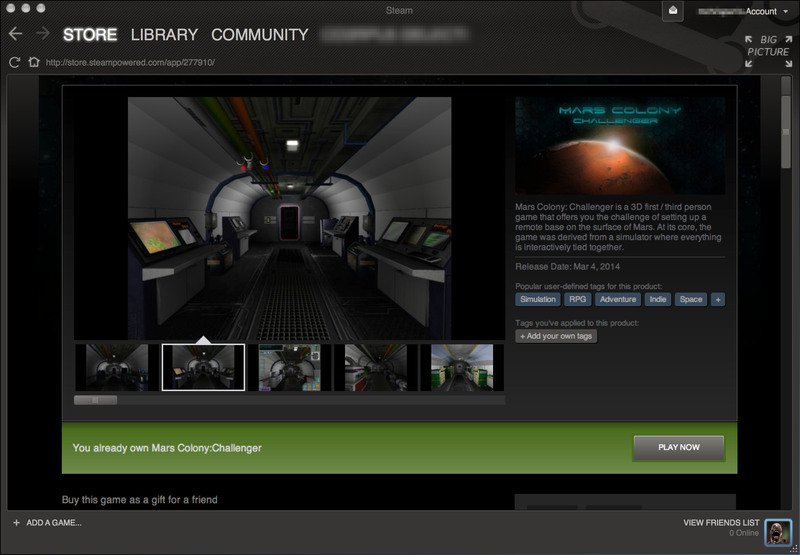 After 3 years of development, Mars Colony: Challenger is now released and available on Steam! During the launch period, we are offering Challenger at 10% off. After many hours of research, code and testing version 1 of Mars Colony Challenger is complete and ready for sale on the HyperKat website. At times there seemed to be no end to the work. Aligning science and research challenges with reasonable game play issues was a huge task. Many gamers want action. They judge the quality of the game by how many bullets they can fire accurately or how much armor their character can acquire. They want to stalk and slay the dragon as their one defining goal for spending the time in the game. The scientist on the other hand wants the totally involved reality of the subject matter and for the most part won’t get involved in the play aspect. They prefer discovery and analysis over running and gunning. As a designer the first thing on my list was no guns, this is a Mars exploration simulation. In reality, there may be guns when we go to Mars and that is a good subject for discussion, but a distraction from the core game goals. What if one of the crew went nuts and tried to kill everyone? Do we plan to have a jail or containment area just in case and how do we deal with the event? We can’t just push them out the airlock but we have to do something. During the course of testing I discovered that some of the players were getting upset over what seemed to be meaningless events like not filling the water can or placing it in an obscure location. This game could be a perfect test vehicle for psychological evaluations and qualification of required personality and interpersonal traits. No Martians or Aliens were allowed. Sure that and no guns make for a boring game, but since there are none to be found as yet we didn’t feel like the game should become a discovery saga. However, there is a remedial life form in the game if the users sample the right area. We left it in the game thinking someday it would be discovered and a great surprise, much like the situation we have now. There just may be some form of amino acid deep in the recesses of the planet and it will be an interesting search and wonderful discovery. We wanted things to be realistic for the circumstance and context. Testers questioned everything we put into the game as far as structure and interactive objects. Most of the complaints about the artwork were aimed at the plain appearance of the objects. They would be plain looking and simple as we could make them. Complexity means failure in an environment hostile to life. Minimizing computer interfaces and integration further reduces failure points requiring in-depth computer electronics and software skills to maintain. I can take a valve or a switch apart and fix it but I can’t repair a computer out at some remote site on the planet. Everything should be as simple as we could make them to be easily repaired and maintained on site. If my life depended on a computer for survival I would live in fear. I have seen the blue screen of death and it troubles me. There are obvious roles for computers to monitor weather and testing samples and even entertainment but the valves and switches I want to control just in case and have manual overrides. Please visit the website, buy the game and support this effort. We want to make Version 2 and need help from the community. It takes many engineering hours and art hours to develop a product like this and I would like to think there is a desire out there to see what it would be like to survive living on Mars. Thanks to all the testers and the art students that helped with this project and I hope to see you all again in Version 2! The current development cycle for Mars Challenger is close to a final product release, however we have hit many roadblocks with the core-rendering engine, and are having to make some technical compromises to create a stable experience. A message to all developers, carefully choose your game engine and make sure it is stable before you add features or cross the point of no return in your design. I have had to debug and redesign many parts of the engine because it cannot or will not work properly, and random, inconsistent crashes dramatically slow down progress. Currently the game engine really doesn’t seem to be much beyond late Alpha or early Beta. And support is poor or non-existent. You should get what you pay for – and that is a stable and commercially viable game engine. Torque 3D is not ready for a commercial complex simulation game – and Garage Games has been ignoring fundamental design flaws despite constantly adding new features and selling paid commercial licenses. The current version of Torque3D has been moved to open source so it will be anyone’s guess as to its destiny as a viable development product. The balance between game and simulation for this project has been hard fought. There were many things I wanted to add to make it more realistic but was penalized in performance to a point the game was no fun. After many hours of play testing I think I have a version that is realistic enough to be interesting yet fast paced enough to offer challenging play. Testing has been and always is an interesting subject. The general game playing populace likes to sign up for beta testing. Not because they want to help but to get a free look at the game before release. Bragging rights to their friends that they were accepted to a beta test is a common goal for them. Real testers in the games industry assume the role of Quality Assurance instead of just tester. They go at the products to follow the documentation and help files to see if the game works mechanically as advertised first of all then they take a look at the enjoyment value of the game itself. Industry QA or testers don’t get the respect they deserve. Most people don’t understand the many grinding hours of testing where one change can affect the whole project, so the run the game over and over. In the 3 years of this development I have run the game over 40,000 times. Think about that number, Do you know anyone that would play a game 40,000 times and not go a bit crazy? Mars Challenger will be in Beta soon and we hope to finalize it within a month or so. This is the time I get to spend going through the help files, doc files and adding or changing all the little icons, taking screen caps to show what the equipment looks like. Then it’s off to the databases to keep track of all the game and user info. It is all about the details, lots and lots of details. We have feature locked this version so now it is a matter of finalizing all the actions. I would like to think this product has applications beyond entertainment since the original purpose was to demonstrate the issues Man will face trying to survive on Mars. Then, we have the whole education side of it. The mechanics, agriculture, biology and geology issues the game provides would be a great way to get students interested in science. Final thoughts: This project has tested my abilities to the breaking point, especially with health issues and a rotating team of artists and testers. I am the type of person that relishes challenge and innovation, and not willing to accept failure or mediocrity. So to my game design colleagues, set your sights high and challenge yourself. Fortunately there is public information on visionary ideas of what colonization of a planet like Mars might be, but a strong lack of DETAIL. When you hold an object in your hand, it has to look right, whether a wrench designed to be handled with thick gloves of an EVA suit, or a portable Ground Penetrating Radar unit that must survive transport and being dragged along the rocky and craggy surface. Like a painting these Points of Interest can represent the Foreground of a painting, focal points that must appear realistic and convincing. Beyond DETAIL, there are the mid-ground elements, like duct work, clutter and graphics on the habitation unit panels. Even branding… of course a private enterprise will want their logos present on systems and devices when images are transmitted back to earth and may become news or parts of documentaries. Yeah, think Pepsi or Bud Light in space… it happens now, will always be part of our environment. But these are the familiar cues… those that help decode what otherwise may be a confusing mass of wiring, foreign looking test equipment. They guide and direct the participant into a sense of real space. Then comes the background. Those things that add ambient and atmosphere and a sense of presence. This is also a trap, as we have discovered. Specifically, I am talking about walking on the surface of Mars. Yes we have some video and images, some very detailed. But nothing from the viewpoint of a human, walking around. In a game engine, we can at best simulate the look, but are extremely limited in the variations that we can provide and keep the build within size parameters (megabytes not gigabytes) and performance limitations of the current engine. In comes the magic of 3D game engines: vertices and normals that represent raw geometry of what is essentially a desert landscape with soft hills and a few rocky outcrops; DIFFUSE (color), DETAIL (image maps), and NORMALS (how light interacts with the surface) mapping provide a lot of illusions to create a compelling simulation. Color is tricky, as is the perceived “depth” of the surface. Oh and then there are the issues of tiling which creates unrealistic repeating patterns… in the real world it would be impossible to find a 1M square of surface anywhere that is identical to another, but in a game engine – there is no budget for a completely unique texture per meter texture, so those assets are repeated and tiled together to SIMULATE a whole environment. Intelligent compromises between the game engine and reality should create a unique experience. To that end, we know, somewhat what the surface of Mars looks like. We have color corrected details, from the vantage point of Spirit and Opportunity. We have 50,000 foot photos that give us an idea of the landscapes from which to base the Colonist activities. We have libraries of information on what Nasa and other space organizations are working through to establish long term presence on various planets. What we do not know, is REALLY how it all comes together. There is a magic, undefined element of surprise, that makes Mars Colony interesting and realistic. That is the human element. This is an unscripted experience in a hostile natural environment. With 4 players, those unknown seeds into a dynamic collaboration will make or break success as they setup and attempt to survive long term. All of the tools are there and must be used, which requires periods of intense focus and has periods of dullness. Our testers have been providing immeasurable and valuable information that has started to help us crystallize on a final product that offers the richest and most realistic science based simulation of a Mars experience. It is HyperKat’s goal to present a perspective on Mars Colonization that feels real and helps to make a compelling case for REAL exploration to the surface of Mars within our lifetime. Mars Colony is still in testing. Though not official, we have effectively moved into the BETA phase. Most of the mechanics are worked out, with a few outstanding issues. Final artwork is starting to be integrated. Now Hyper is working to figure out the productized version of the package. Feel free to join us in the Tester Forum, loving called the Litterbox. A link is to the right. Welcome to the new template. Yes it is orange. Mars is orange, at least through a telescope. Mars Colony is proceeding well. I heard from Hyper that the weekend testing was incredibly successful. He continues to focus on alpha testing and has stomped out most of the major snafus that our illustrious and “well paid” testing team have unrolled. Ok, well paid in process food stuffs and Mars dust. They have been incredibly generous with information, ideas and some pretty crazy edge case scenarios. Seriously? Who drills on the roof of a habitation unit? The screenshot in the header graphic is the latest incarnation of the habitation units, branching into various facilities, and cast with the sunset. We are always looking for new testers, so please feel free to join us in the forum. There are several tests a week, some directed, and some more open format. There is a bit of a learning curve, but some quicky tutorial information has been put together through the dedication of our great testers. Also – there are some great proposals and ideas, get out your abacus and discuss. Tug on the suit and jump into the challenge! For the past year of the Mars Colony development, I have read the ideas presented by the testers about the way they would like to see the game work. We have 250 users on the forums and about 20 of them chime in on a fairly consistent basis. Out of that group of 20 there are 20 different opinions on how the game should run, how it should look and what the user experience should be. I appreciate the input since it provides me a more diverse view of what it would be like to get to Mars and establish a colony of humans there. They have also challenged the science behind what I have created and presume to be the reality of living on the planet Mars. That challenge drives me to make things more realistic from an operational standpoint. I present facts and offer solutions and reasons on how to overcome the obstacles humans would face trying to survive on Mars. Having said all that, as a game designer I have to bend the reality somewhat in order to make it enjoyable for the user. For instance, I can run the game in real time, but the reality of it would be so boring for the user I doubt many would run the game more than a couple hours. You spend most of the day doing research, maintaining the equipment and night time comes and you would sleep. Sleeping online, think about it for a moment. You log into the game and watch your character sleep for 8 real hours? The excitement level at that point would be mind numbing. So as a designer I have to offer the compromise of time compression so the user is always active. I can put cots, bunks in some sleeping quarters and give the illusion of having that ability but for making things playable I compressed a day down to an hour real time. What we are after here is the core user experience. The user wants to drive rovers, discover new things and be put into challenging situations where they have to resolve issues of survival. That is the driving force behind this game. I want the user to experience all the action of setting up, living and surviving in a colony on an alien world with limited resources and help. There are potentially multiple products or chapters in all of this. The first exploration mission, like the original demo is a game in and of itself. Like a camping trip, Colonists set up the tents, get the fires going, explore, get the basic necessities working, enjoy the scenary and then go home. The second trip is about establishing a permanent base, and thriving on planet and is a one way trip for those willing to take the challenge. And the last chapter is expanding the footprint of man on Mars. Humans will always want to see what is over the next hill and will set up camps along the way to make that happen. The current version of the game I am building is about the third key experience. The new base is 50 kilometers away from the main base so if things go wrong or you forget your toothbrush, you are on your own till the next shipment can get to you. I think this will give the user a lot of great Mars experiences. Colonists will have to set up equipment, create a livable atmosphere, get the power generators running and start growing food. I may backtrack and make a prequel version of the first manned landing on the planet or setting up the first colony but from a game / development standpoint I can get more-bang-for–the-game-playing-buck with this version. Perhaps the future of this development will be to put all three chapters into one product but for now I am focused on delivering a great Mars simulation product, with a balance between game mechanics and real Mars science. The real experience here is the human element, and human decisions and interactions with the challenges of long term survival on the planet Mars. Anything that deteriorates that experience, whether that is a game mechanics issue like where new players “spawn”, game play issues like permanent death or conflicting opinions on core science application in the Mars Environment are set aside. Those things that are perceived as critical and important, and play into situations that add to the sense of urgency and excitement add to the experience. Sweeping the dust out of the airlocks? Not so much. As many of you know, HyperKat is a small company. As such, the ability to bring large teams in for development, art and testing are limited. No excuses however… Mars Colony is progressing, but feels somehow bogged down in testing. I wanted to quickly update everyone on what is happening now. Mechanics testing: Mechanical testing is running the in-game systems, arrays and databases through their paces to ensure that a rich simulation is available, as well as enough content to keep the experience compelling and fun. Think of the permutations necessary to ensure that enough potential variables are present to make a system seem real, and tracking the sheer numbers of equipment, resources, resource types and dependencies. We have a great crew of game testers, who wait patiently (and not so patiently) for the weekly server bump and drop in and tear through things. Mechanical testing means that art sits on the back burner until enough bugs (yes there are bugs on Mars, but they only bite when the server is running) are eradicated. This also means that testers get to work with programmer artwork, which in this case is actually pretty good. What this means to HyperKat: Literally hundreds of hours of debug, using both user feedback and server debug logs, to pinpoint the culprit in a couple of millions of lines of code. Some bugs are engine code, some are server/client issues, some are whole systems and arrays that have to be rebuilt from scratch… and all have cascading ramifications in other areas of the code. At the end of this process, the entire game will effectively be rewritten dozens of times, and without good in-line code documentation HyperKat would be lost. What this means to our crack testing teams: It MIGHT begin to feel like little progress. We are thrilled with the feedback, but are still focused on mechanical systems. That means such things as accurate horizon and solar rendering or drill and sample animations are not put into the game. It may also mean that some feedback is set aside in a queue until it can be addressed. It may also seem that every week you see the same programmer art and find new little annoying bugs. However, without you – this game cannot exist! Our testers, as most of you know, are an international crew located in all corners of the world, spending their valuable time exploring the Mars environment. Some stay up very late or get up very early to participate… and we love and appreciate their passions. Bottom line, Mars seems to be caught in a gravity well and progress is slowing. However, the opposite is true. We are approaching mechanical feature completion (unless Marco pops a fuse on the reactor system or Profit parks the rover in the cohab airlock 🙂 ) and with luck can start to address the ingame art. We have a massive list of potential new features that will be evaluated and targeted, thanks to the extensive brainstorming and research of the testers. Our helmets are off to you gentlemen! See you on Hyperia Base! After almost a year of testing the online version of Mars Colony we have come to some interesting conclusions about the reality of the mission versus the reality of the game. One of the tests for the online version was to see how many people would dedicate the time and effort to maintain the colony and how many would just drop in to see what is happening. As in all games of this type there will be users that won’t leave as long as the server is up and others want to just look in on things to see what has changed. The difficulty in creating this as a game is all about the level of activity for the users. I set the game up to require constant attention. The plants need water and fertilizer, the solar array needs cleaned, the Fuel Cells need recharged, the fish need fed and the equipment needs serviced. If no one logs in and keeps after all this work things fall into disarray. It was my hope that the users would organize a bit and get a schedule for maintaining the colony but I haven’t seen that happen yet. The game will have to be a bit more casual and some of the systems will have to be put into automatic mode in order to keep things working properly. I can’t know when people will jump in and do things so I have to change the methods a bit. On the reality side, if you don’t water the plants they will die. If you dont keep the power systems running and the hubs warm, the fish will freeze and the plants will die. Having to live in this situation you would be more energetic about keeping yourself alive, warm and fed. Just having to keep after all the equipment would cut way down on the boredom of living in such a hostile environment. The issue of transporting this extreme living condition to a simple, more or less casual game is one of the greatest challenges a designer will have to face. I can’t force people to log into the game to make sure the generator has fuel so how do I give the user the Mars experience when they are only occasional visitors. Most of the systems will have to be auto-magic and take care of themselves and it would be hard to plan a crisis to challenge the users when the users may or may not log on at any given time and stay for an undetermined amount of time. I am left with offering simple tasks for the user. Go fix unit A, take this load of X over to camp B etc…. As I see it this will get boring rather quick and the game will lose any value after a dozen log-ins. We will be going through a second phase of testing in the near future to see if we can balance the casual user with some excitement in the colony. One of the tests will be to have things work automatically until someone logs into the game then have “issues” that will require user attention. This will be a delicate balance to code in order to keep things fresh and challenging for the constant users as well as the casual users. Apologies for the length between updates on the blog. Lots of reasons, but few excuses. It has been a chore keeping up with what’s happening in the space exploration world, ensuring that Colony remains relevant and somewhat current with the new thinking. Colony has currently split into two main projects: The Colony MCO project, which has evolved into a collaborative online community of Mars enthusiasts – many with great knowledge and curiosity, AND Colony: Surveyor – a mission oriented variation of the above that doesn’t carry all of the coding and programmatic challenges with a semi-persistent colony. Colony: Surveyor has a strong direction, and provides a much more elegant platform to pursue and solve the challenges being discussed in the space community today. My recent discussions with Howard have gotten me excited about the opportunities. There are still programmatic and mechanical challenges to present a very rich and deep simulation experience, along with game elements that help make this simulation both fun and rewarding for the player. Hyperkat has not abandoned Colony MCO, dedicated to ensuring that a long term persistent experience is available. This is still a very important project, that fortunately shares the bulk of code with the Surveyor project. Howard, and the beta testers, have been carefully following the newest developments; plans to put a station on Earth’s moon, new ideas on how to build structures on Mars and so forth. SPAM: Really, when are we going to evolve past the point that random spams, both to this blog and to the forums will end? Bless those dedicated coders that maintain the source code and security elements for both platforms, their efforts have saved us from some VERY embarrassing posts, yet spammers still seem to get past! What a waste of bandwidth and time! So a question: Given the need for communication between Mars colonies and Earth, how would you respond if you were EVA in a suit for 5 hours repairing a water processing unit, and your HUD suddenly flashed with the latest Cialis scam or an announcement that you just won a lottery? Me? I would wander back to the co-hab, open up a can of SPAM and fry up a nice hash with potatoes. Then log into the forums, blogs and other systems and delete all of that electronic garbage! Shame we can’t turn those bits into compost.